Should each county get a single state senator? The blue Clark County tail wagged the red Nevada dog in this past week’s election.Election results show rural and urban Nevada are of two vastly different states of mind. For example, in the race for the U.S. Senate, Democrat Jacky Rosen carried only Clark and Washoe counties, while Republican incumbent Dean Heller won every other county handily. In the more heavily unionized, redistribution-favoring and thus Democrat-leaning Clark and Washoe, Rosen gleaned 55 and 50 percent of the votes, respectively. Whereas, for example, in Elko County Heller netted 76 percent of the vote, 72 percent in White Pine, 79 percent in Lincoln, 75 percent in Esmeralda, 63 percent in Storey, 72 percent in Churchill, 79 percent in Lincoln and a whopping 84 percent in tiny Eureka. Quite a spectrum shift. The state’s only Republican representative in Washington now will be Mark Amodei, whose 2nd Congressional District covers the northern half of the state and excludes Clark. Amodei won in every county and his Democratic opponent only came within spitting distance in Washoe and Carson City. Amodei took Elko with 80 percent of the vote, Humboldt with 79 percent and Lander with 82 percent, for example. Republican Cresent Hardy won in every county in the 4th Congressional District in the southern half of the state except Clark, while the other two Congressional Districts are solely in Clark and were easily won by Democrats. Democrat Steven Horsford won the 4th District seat by pulling 52 percent of the total vote by netting 56 percent in the more populous Clark. Hardy netted 73 percent of White Pine’s votes, 80 percent of Lincoln’s votes, 74 percent of Lyon’s, 57 percent of Mineral’s and 65 percent of Lyon’s. In the statewide races for constitutional offices the numbers broke down largely the same. In the race for governor, Democrat Steve Sisolak won handily in Clark and eked out a victory in Washoe, while Republican Adam Laxalt won almost every other county by at least 2-to-1. The results were similar in the race for lieutenant governor. Incumbent Republican Secretary of State Barbara Cegavske edged out 30-year-old inexperienced Democrat Nelson Araujo by less than 1 percentage point, though she won handily in every county except, you guessed it, Clark. In the race for attorney general, Republican Wes Duncan won in every county, repeat after me, except Clark. Likewise for Republican treasurer candidate Bob Beers, while incumbent Republican Controller Ron Knecht lost only in Clark and Washoe. Again, in mosts cases the margins in rural counties exceeded 2-to-1 for the Republican. The Democrats in the state Assembly are all from Clark and Washoe. The rest of the state picked Republicans. Due to the overwhelming population of Clark and Washoe, there is now a supermajority of Democrats — 29 out of 42. 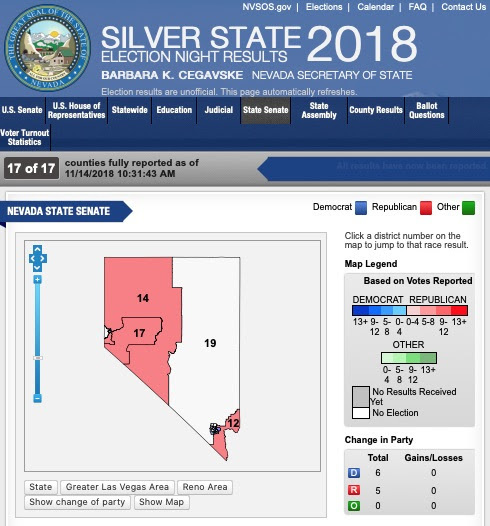 The state Senate is also all red except for Clark and Washoe. The 13 Democrats to eight Republicans leaves the Democrats one seat short of a supermajority. That could happen if a planned recount changes the outcome in a district in Clark in which the Republican won by 28 ballots. It takes a supermajority in both the Assembly and Senate to pass tax increases, thanks to an initiative pushed through by former Republican Gov. Jim Gibbons. yes, Hillary Clinton and not Donald Trump won, it seems only fair that we be allowed to deign to suggest that Nevada could change its governing bodies to more closing match the federal system created by the Founders. We could have an Assembly in which representatives are seated from districts of approximately equal population and a state Senate with a single representative from each county. The whole purpose of the U.S. Senate is to assure smaller states are not run over roughshod by more populous states. So why should the smaller Nevada counties with differing philosophies and priorities and issues be virtually shut out of the decision making process? Of course, the chances of that ever happening is almost certainly nil. So, consider this a wee Jeremiadic cry from the desert and a whisper in the ears of the near-supermajority to give some slack for the smaller rural counties. Seems only fair. And we know Democrats are sticklers for fairness. Historic update from Wikipedia: In 1919 the Senate started a practice called “Little Federalism,” where each county received one member of the Nevada Senate regardless of population of said county. This set the Senate membership at seventeen which lasted until 1965-1967. The Supreme Court of the United States issued the opinion in Baker v. Carr in 1962 which found that the redistricting of state legislative districts are not a political questions, and thus is justiciable by the federal courts. In 1964, the U.S. Supreme Court heard Reynolds v. Sims and struck down state senate inequality, basing their decision on the principle of “one person, one vote.” With those two cases being decided on a national level, Nevada Assemblywoman Flora Dungan and Las Vegas resident, Clare W. Woodbury M.D. filed suit in 1965 with the Nevada District Court arguing that Nevada’s Senate districts violated the equal protection clause of the Fourteenth Amendment of the Constitution of the United States and lacked of fair representation and proportional districts. At the time, less than 8 percent of the population of the State of Nevada controlled more than 50 percent of the Senate. The District Court found that both the Senate and the Assembly apportionment laws were “invidiously discriminatory, being based upon no constitutionally valid policy.” It was ordered that Governor Grant Sawyer call a Special Session to submit a constitutionally valid reapportionment plan. The 11th Special Session lasted from October 25, 1965 through November 13, 1965 and a plan was adopted to increase the size of the Senate from 17 to 20.